‘The course of our lives can be changed by such little things.’ This thought is put to paper by Lisa Berndl, the female protagonist in Letter from an Unknown Woman (1948). Even though that movie is one of heightened passion and sweeping sentiment, it is director Max Ophüls’ eye for ‘such little things’ that elevates it above mere melodrama. Letter from an Unknown Woman is a tale told with well-timed silences. The stormy love affair at the heart of the movie is played out in the most subtle of breezes. Literally. Because a gentle gust weaves through the story as an airy motif. The cinemagraphs (1) below try to capture that draughty pattern. Lisa Berndl (Joan Fontaine) is just a teenager when the events in the movie start to unfold. She lives in an apartment complex in Vienna, when her world is shaken up by the arrival of a new neighbor. Stefan Brand (Louis Jourdan) is a successful concert pianist. Lisa is immediately infatuated with the sophisticated musician, but has to admire him from afar: Brand is a ladies’ man who never takes notice of his youthful neighbor. Lisa’s love is not dampened by his lack of attention. Over the course of several years, the flame of her fascination keeps burning. Throughout the movie, Ophüls uses not a fiery but an airy motif to clue in the audience on Lisa’s emotional state. This motif is instated in Lisa’s very first scene. When movers are unloading Stefan Brand’s belongings, a nosy Lisa goes through them. Even at this very early stage, and before she has laid eyes on him, the new neighbor seems to move her. Or her hair, at least. While she is rummaging through the household effects, her hair bobs in a breeze. Certainly, she is out in the street, but she seems to be the only one affected by the current of air. It’s the windy herald of the love that will blow her away. Lisa’s attraction to Brand is as musical as it is romantic. She takes to sneaking out of her room at night, to sit at his window and listen to him practicing his piano playing. When she opens a window to better hear his musical exercises, a breeze blows through her hair. She is outdoors, but the wind only picks up when she opens the window: as if it is the music itself that wafts its way outside, fanning the strands of her hair. To a physicist, this gust of air is completely illogical. To a romanticist, it is genius. When her mother informs her of the family’s plans to move to Linz (away from Vienna, and from Stefan Brand), Lisa is understandably distraught. Even before her actions and words make this clear, her hair gives her away. Although the scene is set indoors, there is again a current of air ruffling her hair. Only Lisa is affected by it: her mother’s coiffure seems set in stone. Years later, the ill-fated couple finally meet. They spend a single evening (and night) together. Stefan takes Lisa on a romantic date. They wind up on a fair and together they embark on an amusement ride. In a make-believe passenger coach they train from Venice to Switzerland: painted backdrops operated by a man on a bicycle. Even though their carriage is stationary, Lisa’s hair again moves in a breeze. Nonsensical, but justified from a storytelling view: this is the closest she’s ever been to the love of her life. In that same scene Max Ophüls wraps up his airy motif beautifully and with crushingly tender elegance. A single, subtle, small gesture removes all doubt as to who or what is the cause for those recurring currents through Lisa’s hair. Stefan takes a seat next to Lisa. As they chat and flirt, the musician casually blows through her hair. A train horn sounds. Lisa looks up at him, with the same innocent smitten expression she had years before. It’s a whiff that makes her believe she can become his wife. That, of course, is not to be. The two drift apart after their brief encounter. Stefan goes back to his philandering ways. Lisa marries and settles into the safety of a sheltered society life. Her hairdo changes: her flowing locks of hair are neatly coiffed into immobility. The hat that she wears often also serves to shield her hair from breezes. Lisa and Stefan meet once more, years later. By that time, their chance at romance has blown past. Stefan barely remembers Lisa. This time, his flirtatious ways fail to put a breezy dent in her hair. “The course of our lives can be changed by such little things.” Lisa comes to accept the fickleness of fate. “So many faces, that one might be easily lost.” Their love was not to be. That’s just the way the wind blows. (1) Cinemagraphs are animated gifs in which the animation is limited to only a (small) part of the image. Most of the image is still, but some minor movement is repeated in a loop. The term was apparently coined by two photographers, Kevin Burg and Jamie Beck. Their website has a lot of examples of this technique, mostly fashion shots. 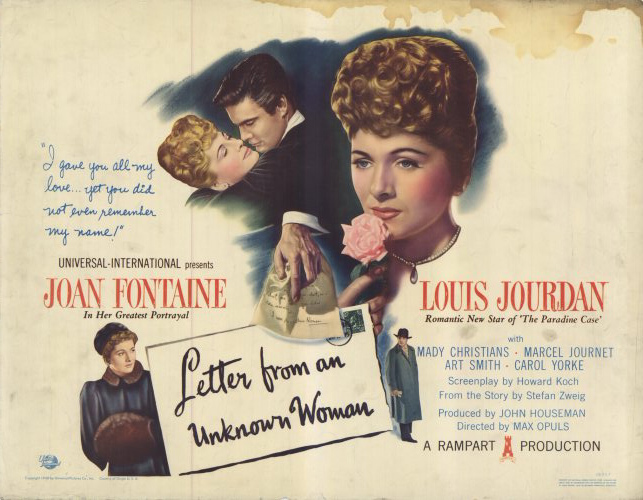 Letter from an Unknown Woman [feature film] Dir. Max Ophüls. Rampart Productions, USA, 1948. 86 mins.